Beautiful, light and elegant! This is Organic Food! 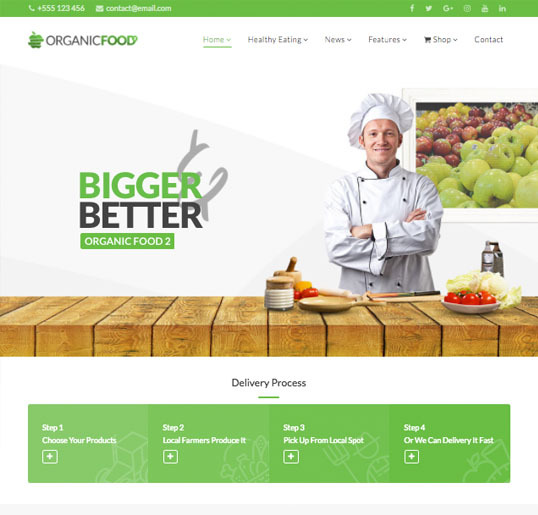 Organic Foodis a colorful WordPress WooCommerce theme, perfectly suitable for an organic food shop, healthy food blog, agricultural business, agro-tourism, organic farm, bakery and so on. Theme has an informative layout that looks awesome on any platform because theme is fully responsive and Retina ready. Organic Foodis really wonderful WordPress e-commerce theme! 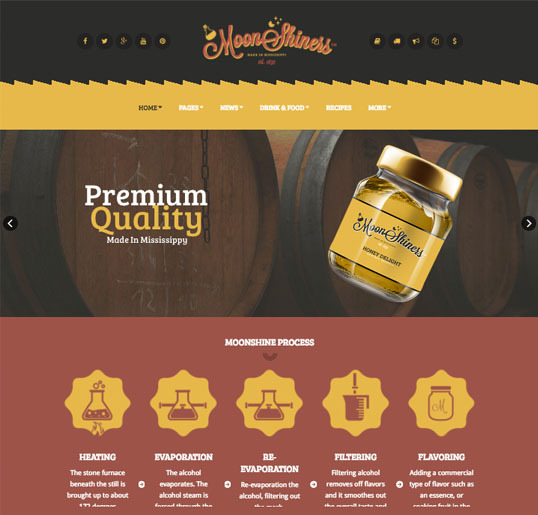 Moonshiners is Niche & creative, responsive WP Theme. Specially build for distilleries, microbreweries and brewpubs with great ideas and cool stuff, with which you can also build any type of web site. The Theme is build on Bootstrap 3.3 and has UI Kit implemented as well. 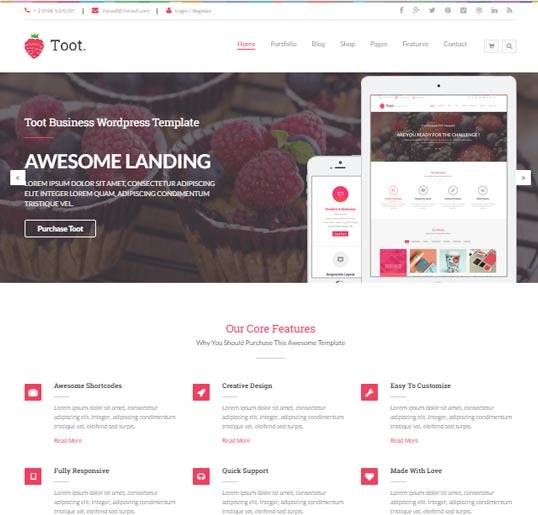 Toot is aclean and unique multi-purpose WordPress Theme for all kinds of sites & business. Featuring latest web technologies, enjoyable UX, beautiful design trends and based on Visual Composer designed with terrific attention to details, Usability & high performance. It is ultra professional, smooth and sleek, with a clean modern layout, for almost any need: Corporate Site, Ecommerce site, Photo Studio, Personal Blog, Shop, business companies, corporate agencies, organizations, creative designers and much more. This WordPress Theme can easily satisfy all of your needs. With over 25+ Homepage Concepts ready to go or combine, build a layout has never been easier. There is a huge range of styled pages waiting for your customisation, anything you can think of can be built with Toot. If you are searching for innovative, modern and clean WP Theme, You must choose Toot. The WP files are fully layered and customizable and all elements are in groups and can easily identify by the group name as well. It’s very important for bloggers, writers, agencies or any other organizational businesses in gardening & landscaping industry to choose the right WordPress theme for highlighting their gardening services, persuading and building up trust in customers. Erik’s exquisite design with plenty of responsive homepages, blog layouts, and comprehensive shortcodes will assist you greatly in perfecting your landscaping & gardening website and drawing attention from potential clients. 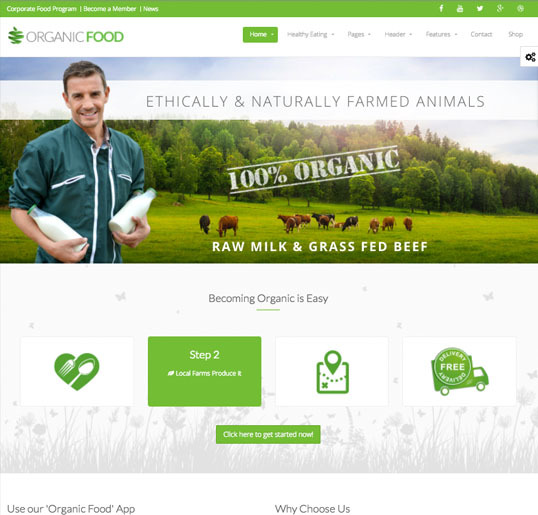 Organic Food is a clean, modern, functional and easy-to-use responsive parallax WordPress theme that has been purposely built for the organic food, organic shopand organic farm industry.